Wonder Woman says "Stuff My Stocking with Wonder Clips! I use them whenever I am mending my lycra body suits. They are perfect to hold the body armor sections in place instead of straight pins that can leave little holes. Those little holes allow my enemy's gamma rays to penetrate and weaken my defenses. Don't let your defenses down! Buy Wonder Clips!" 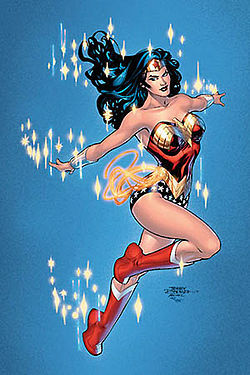 I agree with Wonder Woman, every time I need to mend my lycra outfits I need these clips. And even when I'm not into my lycra, I use them for all my binding edges, laminated fabric and leather projects. See how great they fit on the edge of my binding waiting to be hand-stitched? Just like the Wonderbra, these Wonder Clips from Clover are going to revolutionize your life! I even found out that they work to hold my pieces together when I am doing English Paper Piecing on my great hexagon project. There are so many uses for these clips, we knew you would want more than one package. today you can have them for 25% off, only $24.73! There's no one else offering you this kind of a deal! So if you have been spending time shopping for everyone else on your list, put yourself back on the list where you belong, Wonder Woman!